If your need for an assistant is sporadic and unpredictable, but you prefer to use the same assistant or a trained backup so that you don"t have to invest more time in training, then you can pay a retainer fee and use our services for any task whenever you wish. 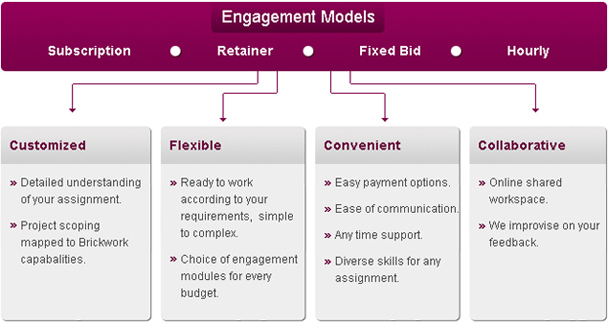 If your assignment can be well-defined and the scope clearly understood with a definite finishing date, then the fixed bid project model is the appropriate one to select. If you don’t have regular work and want to try out our services; or use our services for only for a month or so, then we offer you the flexibility of buying a block of hours as per your requirement by paying in advance before the beginning of the project. Upon request a utilization report/time sheet will be provided with the time utilized for your assignment.